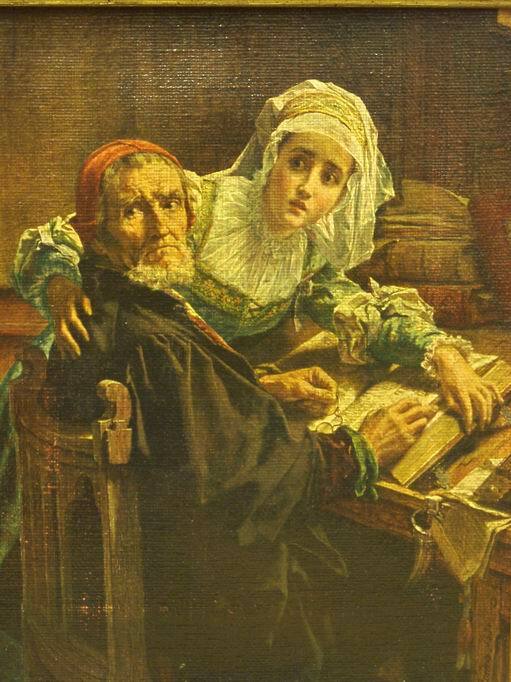 The Forbidden Book by Karel Ooms portrays a Protestant man and his daughter during the time of Roman Catholic persecution. They are studying the Scriptures together, and have just heard a knock at the door. Bach’s greatness is compounded of many elements. He could combine the sacred and the secular without jeopardizing the mystical wonder of the one or the dramatic intensity of the other. He could fuse in one the popular elements supplied by the chorales and the aristocratic elements represented by consummate technical skill. He could carry realism to its utmost limits, yet he never overstepped the bounds of liturgical propriety. He was at once a daring innovator and a ‘perfect formalist’ – the master of both his subject matter and his form. He showed that Palestrina’s beauty (always mystical but often vague) and Handel’s vigour (forceful but somewhat material) could be fused in an art which surpassed the farthest reach of either. He accomplished it with an authority which imparted a touch of finality to almost everything he wrote. The firm assurance is more than a product of supreme skill. Bach offers an interpretation of life which transcends the limitations to which the work of lesser men is subject. The central thread which unifies the amazing skill, subtlety, and penetrating insight of his works is the motif of faith. He was fundamentally a religious man. To compose music was an act of faith; to perform it was an act of worship. Bach was the greatest of church musicians. In a sense he was also the last…In religious music Bach represents the summit of achievement; after him the descent was rapid.